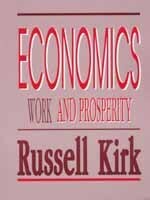 The late Russell Kirk was a historian, not an economist, but this book is an excellent introduction to the principles of economics. It is readable and short, and it gives students a clear grasp of prices, costs, and the roles of entrepreneurs and governments. The book is especially useful for its many illustrations of economic ideas from history and literature. Kirk is a storyteller and high school students will appreciate learning economics through stories rather than graphs. Kirk lists the strengths of market economies and emphasizes the creative results that occur when millions of people compete to provide the best and cheapest goods and services for others. He characterizes the command economy, on the other hand, as having inherent inefficiencies that result when people are not free to own property and accumulate wealth. He uses Alexander Solzhenitsyns experiences recorded in The Gulag Archipelago to show the problems with bureaucracies, black markets, and lack of consumer support in Russias command economy of the 1950s. Kirks book has not been revised since its release in 1989. The mixed rating of A-/B reflects the need for updating the book to include the fall of communism and other developments of the 1990s.